We will have another big derby match with Manchester United against Manchester City that will decide who will be the top of the table and probably decides who will be the winner of this season's EPL title. If MU won this match, they will be 6 points away from City and in theory, it would be impossible for them not to win this title. They also have bigger chance if they can force a draw with City. In the meantime, both losing and draw is not an option for Mancini's team. They have to win in order to survive. Winning this match will take them to the top of the table because they are better in terms of goal differences and i think it would be a big advantages for City. For those who are living in Indonesia and wanted to download the latest Ubuntu/Kubuntu 12.04 releases, you can find the ISOs on our ISO Server at UKDW: http://iso.ukdw.ac.id. We provided CD/DVD ISOs for 32/64 bit architecture and for amd64 and i386 processors only. We skipped the PowerPC because almost none of us use that machine in our campus. We also skipped Mac version, so it's pure Intel and AMD processors only. We also host Ubuntu repository which can be seen at http://repo.ukdw.ac.id. It's updated regularly, so you can use it if you are living in Indonesia. I found an article that explains about how to root Sony Xperia Neo V. Please note that rooting might break the waranty, so use it on your own risk. Any damage to your phones after applying this steps will be your responsible and not mine nor the author of the article. The phone with unlocked bootloader and it should not be locked to any other network too. Complete back of all the data on the phone including contacts, call logs, text messages, MMS settings and other important files. The battery should be about 70% full. It is recommended to uninstall any kinds of security programs or antivirus software so that the rooting process remains unhindered. Android SDK is downloaded and installed in the computer. Installation of the Android USB drivers for Xperia Neo V and fastboot is to done on the computer. The recovery image and the rooting files for Xperia Neo V are downloaded and kept. This list completes the requirements for the rooting process. Now the actual rooting process of the phone commences. It is very important to follow all the steps carefully as missing a single step might harm your phone. Start by installing the Android Software Development Kit (SDK) in the computer. Now you need to download the USB drivers and the fastboot archive and save the folders on your computer. There will be two folders. Go to the folder where the fastboot_with_Android_USB_file.rar is extracted. All the files inside the fastboot folder are copied. Now go to the Android SDK installation folder and open the “Tools” folder inside it. Paste all the copied files there. Also copy the recoveryNeo.img to the same “Tools” folder. Copy RootXperia.zip and paste it to the root of the phone’s SD card. After these, turn the phone off. The phone is then to be put in fastboot mode. For doing that, you need to connect your phone to your computer with the help of a USB cable. While you connect the phone to the computer via the USB cable, press the Menu key. A command prompt is launched on the computer. Change the directory to the place where the adb.exe and fastboot.exe are located. They are usually in the “Platform-Tools” folder or the “Tools” folder in the SDK folder. The device will automatically reboot into the Recovery Mode after the last command is entered. While in the Recovery Mode, select “install zip from SD card” and then choose “RootXperia.zip”. Select by using the Power button. It takes some time for the installation to get over. Rebooting the phone completes the rooting process. Follow the guidelines well and get the rooting done in no time at all! Today, Oracle releases updates to several of their products, including VirtualBox and Java. VirtualBox 4.1.14 maintenance release is now the latest version and this version only fixes 3 bugs compared to previous releases, so if you are not really affected by the bugs mentioned on the Changelog, you can safely stay with the current version installed on your machine. Ubuntu 12.04 is finally released by Canonical after Kate Stewart announced it on the Ubuntu-Announce mailing list. This is a LTS version for Desktop, Server, Cloud, and Core products, that means this version will be supported up to 5 years for all products, not just the servers. This release also the first Ubuntu Linux releases that introduces Head-Up Display which was introduced by Mark himself on his blog. For more new features in Ubuntu, please see the desktop and server articles. Canonical also releases Kubuntu 12.04 (LTS), Edubuntu 12.04 (LTS), Xubuntu 12.04 (LTS), Mythbuntu 12.04, Lubuntu 12.04 and Ubuntu Studio 12.04 in the same time. Please note that there will be no more support from Canonical for Kubuntu 12.10, and it will be replaced by Blue Systems. Unfortunately, the release enjoyment was a little dissappointment as their main website can't handle the traffic and has been brought offline. It appears that they are using Drupal as their content management system. Probably they will replace or tune it to be more scalable for this kind of release which will often regularly every six months. Mark Shuttleworth have also introduced the codename for the next Ubuntu Linux, which will be Quantal Quetzal and it's scheduled in this October. I noticed that Google is releasing a new product called Google Drive yesterday and when i did, i asked them to notify me when my account is ready. 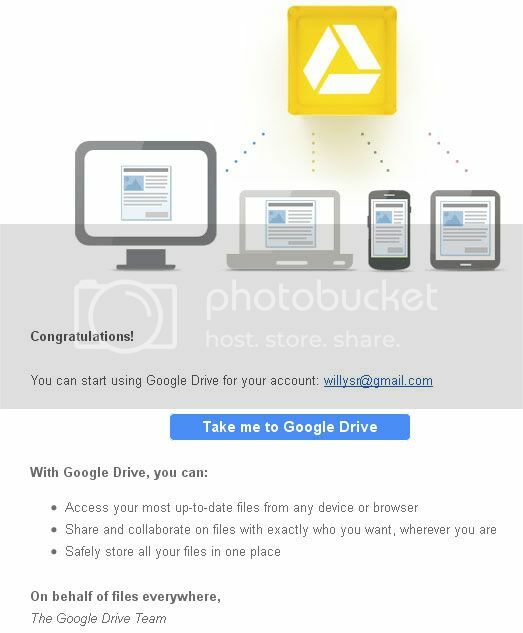 This morning, when i checked my email, i received an email from Google with a subject of "Welcome to Google Drive". That is fast, not even 24 hours before i submitted my request. I clicked the link and it launches Google Drive, which uses my Google Docs account and switch it to Google Drive. So, actually Google Drive is somewhat Google Docs + Sync capability. They have a Google Drive client tool for Windows, but unfortunately, there's no client for Linux (yet). Teresa Wu, google docs community manager commented that Linux support is still being worked on by Google. I hope they don't end up like Picasa which was a good product by Google, but in the end, they stopped supporting it. Once i downloaded and installed the client tool, my files on Google Drive (was Docs) are being copied to my computer and i can start working offline and everything will be synched up to my Google Drive account automatically. Google has announced through Gmail Blog that they are upgrading GMail's capacity from 7.5 GB to 10 GB (and still counting) to celebrate the their new service: Google Drive. This changes will not be instantly rolled out globally, but it will be completed by the next 24 hours. Although 2.5 GB is not that much, it's actually more than enough space for most users in GMail. I myself only used around 2.3 GB out of 7.5 GB provided by GMail. In other Google Blog, they also announced the arrival of Google Drive, which can be used for people to work collaboratively with others. It's like a shared Google Docs IMHO. For starters, Google gives you 5 GB of storage for free. If you need more than that, you can buy additional storage. When you upgrade to a paid account, your Gmail account storage will also expand to 25GB. You can also expect Google Drive to be integrated with other Google products, such as Google+, GMail, GDocs, and don't forget about Chrome Web Store where you can install apps that can be used to create documents or videos or music that will later be uploaded to Google Drive. In order to honor Gideon Sundback for his work on zipper, Google has changed it's main page into a zipper in which you can slide down to open up a default search which will look for Gideon Sundback. I noticed that in the last few years, Google doodle is changing quite a lot. They not only celebrating public holidays on certain countries, but also honor certain people who have done a great job inventing something in the past. This is a great idea because most of us didn't know about the author of those inventions if Google didn't show it on their home page. I found a nice article about Guide to Install ICS as well as root Sony Arch S, Ray, and Neo V. This article covers on how to upgrade to ICS (Ice Cream Sandwich) 4.0.3, Build number 4.1.A.0.562 for several Sony phones (Arch S, Ray, and Neo V). For now, Sony is still working to push the ICS update globally, but it will take some time before it reaches your country. So far, they are still pushing the updates to people in Nordic area. Other area such as America, Australia, and Asia are still waiting for the official updates from Sony. If you live in these continent, but still wanted to upgrade now, you can use the above article to download the latest firmware and performing manual upgrade (don't forget to back up first). For those who wishes to see what others have said about ICS update, please see this thread. Remember, each person will have different opinion, but i guess we can see the overall opinion after looking all the comments there. I have started a new GIT repository on GitHub called SlackHacks. It's just created few hours ago and i wanted to use this repository to put my "hacked" SlackBuild that works for Slackware-Current. Usually, SlackBuild scripts are designed to work with Slackware-Stable, not for Slackware-Current. Unfortunately, the nature changes in -Current looks more interesting for me, because there might be time when new changes in -Current break compatibility with older version and need some "magical touch" aka patches to work with newest version. As the policy in SlackBuilds required us to submit packages compatible to -Stable only, the only way to provide updates for Slackware-Current users is via third party repository which is outside the SlackBuilds project. I will also use this repository to learn more about GIT. If you came from Windows background and you wanted to try creating applications that will be used for Android and iOS but you don't have Macintosh machine, then you can try to use Mono from Xamarin. They have been working closely with Microsoft in the past to provide open source platform which is compatible with Microsoft's .NET specifications and now, they want to improve it much further by adding support to iOS and Android SDKs. For iOS, you might want to try Mono Touch and Mono for Android is for Android. Both projects are updated frequently and they are keeping up with the latest version of SDK available by both vendors (iOS 5 and Android 4 Ice Cream Sandwich). Since it's .NET based, it's well integrated with Microsoft Visual Studio and since it's also available for Mac, you can also use XCode as your IDE and use .NET classes in your MonoTouch apps. You can also easily bind existing C and Objective-C libraries. In the blog post, it was also mentioned that LinuxMint will have an upcoming partnership with CompuLab and also Yahoo while they are still discussing with Google and ThinkPenguin. I believe Linux Mint is enjoying their current status as number 1 Linux distribution based on Distrowatch ranking. Linux Mint 11 will be supported until October 2012. Linux Mint 9 and Linux Mint 12 will be supported until April 2013. Do you know that Google has released a new feature on their Google Maps? This new feature is the MapsGL extension that allows you to see the map in 3D views. It uses WebGL (Web-based Graphics Library) as the backend to produce wonderful 3D imagineries. One good thing about WebGL is that most browsers has support this feature and included this into their products, so users don't need to install additional plugins such as Flash Players or JRE or whatsoever. At the bottom of the window, check the Show Develop menu in menu bar checkbox. For Windows machines, must have drivers published later than January 1, 2009. Note that some users have reported having issues with the Intel HD 3000 video card. Last night, there was a big match between Bayern and Real Madrid and the host became the winner with a 2-1 win in Alianz Arena. This is not the end for Real Madrid because they still have a chance in Bernabeu and actually they have a good opportunity because they scored an away goal. They only need 1-0 to secure their ticket to final. Meanwhile, in the next few hours, there will be another big match in the semi final of Champions League between Chelsea that will be the host against another Spanish club, Barcelona. It will be another great match because both team are offensive-type club and they like open play, which makes football so interesting to see. Sony has stated that they will roll out ICS update for Sony Xperia model in Q2 2012 and hey, it's mid April and right now, they have already roll it to public. According to a post in XPeria Blog, there hasn't been any increment/decrement after upgrading to the latest ICS. FYI, the information used by XPeria Blog was Sony XPeria Arc S which has 1.5 GHz processors. Among the changes are quick dial, new recent apps viewer, quick response for incoming calls, improved email app and better monitoring & control over mobile data. To maintain an optimal user experience, they have included a Performance Assistant which lets you disable certain apps from running for better performance. EBay, Inc has expanded their networks to Indonesia by creating a joint-venture company called PT MetraPlasa with Telkom, biggest telecommunication company in Indonesia. Telkom will hold 60% of the share, while EBay will have 40% and they have an option to increase the share later. Jay Lee, Senior Vice President eBay Asia Pacific said that 17% of EBay transactions were made from Indonesia and that's quite a big number. They saw this opportunity and with Telkom's marketshare, i think they made a very good choice. Let's see what they can offer to Indonesian people about their new promotions. I bought a new phone for my wife for her birthday present. It's Android-based and at first, i'm really impressed with the feature. After using it for few days, my wife asked me about the battery performance. She needs to recharge once a day, something she would never do with her previous phone. I remembered that due to the concept of smart phones, most of the features are using Internet, location service, push mail, etc. That consumes a lot of battery. This gets worse since the default configuration seems to enable most of the features that connects to the Internet. I have tried several article posted on Internet to reduce the battery consumption, but it seems that it doesn't have much effects. From my observations, display, phone idle, and track id are the applications that consumes the most, but it's part of the system and there's no way to remove track id application. I can reduce the brightness and backlight timeout, but still it doesn't improve much. Let's hope with the introduction of Ice Cream Sandwich in Q2 2012, the battery consumption gets better. In terms of battery life, i still prefer iOS. They are so mature in terms of preserving battery life, but don't sacrifice performance as well. Today, i just tested Gentoo LiveCD on VMWare and wow, it's so fast even though it's running on virtual machine, not a native machine. I have heard that Gentoo is very optimized because most of the system are compiled according to user's preferences, but i never thought that a LiveCD version will be able to do perform under the same condition as it's in native. Judging from the performance, i'm interested to try installing a real Gentoo Linux on my VMWare machine at weekend. Since Gentoo requires Internet connection to download most (or should i say all) of the packages, it usually takes few days (in Indonesian typical Internet connection) to get a fully running, usable system. Unlike previous releases, PHP is quite fast with a maintenance update on PHP 5.4.x series. It's 1 month since PHP 5.4.0 was released last month and now they are already releasing PHP 5.4.1 RC 2 for public testing. Since it's a maintenane update, there's no new feature on this release, just bug fixes. The final schedule for PHP 5.4.1 is April 26 and hopefully it's on time. The developer of Calligra has finally released Calligra 2.4, the first stable release of Calligra, a fork project from KOffice. The road to this first stable release is not easy as it took about a year to complete, but it ended with a good results. The text layout engine is completely rewritten, giving the best compliances with ODF specs so that they are not way behind LibreOffice who keeps on moving on with better ODF compliance. They also took this chance to simplify the user interface which was pretty messed up in KOffice. In addition to the normal office applications, Calligra also includes several new applications, such as Flow, the diagram application and Braindump, the note taking applications. It has joined the new family of Calligra. Here's an example of Krita, a drawing application from Calligra with piece of art by David Revoy. Looks so stunning!! My wife just bought a new phone replacing her old Nokia 70 which has accompanied her for about six years. 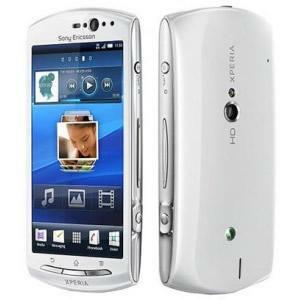 I showed her Sony Xperia Ray and she was so interested on it because it's not that expensive, yet it has a good quality from the 8 MP camera. It also has front-side camera, something that rarely found on modern phones. It's Android-based and even though it's still using Ginger Bread (2.3), it's upgradable to ICS (Ice Cream Sandwidth) 4.0 later on Q2 2012. She likes it very much and hopefully she can make use of it more optimum rather than just for gaming. For me, i'm interested with Sony Xperia S which has 12 MP of camera and it also has faster processors (1.4 GHz). Another product that i am also interested with is HTC One X. It also has 12 MP of camera but it has Quad Core of processors (yes, it's probably the first phone that utilize four cores). It has a price about 6 million IDR i guess (using an assumption of 2000 MYR in the brochure i got when i went to Malaysia last week). For those who care about Security in PHP must know about Suhosin, made by Stefan Esser (aka i0n1c). It's an advanced protection system for PHP installations which provides better protection by adding patches that never pulled by the PHP developers into their main code. I have been using this project for some time to add protection on my server that i manage. Ever since PHP released 5.4, the patch is no longer compatible due to some big changes in PHP 5.4, such as the removal of magic quotes and many other features that prone to securities. In one side, this is good news, but in other side, the patch that Suhosin provide is not available for PHP 5.4. Stefan has said that he's working on Suhosin to be compatible with PHP 5.4, but that would take some time to complete. In fact, he mentioned that it would be completed around April. Let's hope his schedule is not slip. Willy Tarreau has confirmed that he is no longer planning to update Linux Kernel 2.4 anymore, which means the development or maintainance phase of Linux Kernel 2.4 has been stopped completely. Linux Kernel 2.4 was released on January 2001, which means it has been used for 11 years. On this kernel, some important features were developed, such as EXT 3, Bluetooth support, LVM, RAID, USB, ISA Card, and many more. It was superceeded by the release of Linux Kernel 2.6, two years later. Now, after 11 years of used, i think most of the people have started to migrate to Linux Kernel 2.6 or even 3.0 which was released on July 2011. After almost one week of holiday (6 days, 5 night actually), i have finally made it back to my hometown, Jogja (Indonesia). I took an AirAsia flight this morning from LCCT, Kuala Lumpur at 7 AM in the morning on flight number AK 1324. I was picked up by the driver at 4 AM in the morning and then we drove to the airport. I was quite surprised that even in 4 AM, there were some people who still eating in Alor Street (the famous place to experienced a lot of Chinnesee food in Malaysia). The destination to the airport was quick, since it's early in the morning. When i arrived, we go directly to the check in counter and put our luggages and head on to the waiting room, waiting for departure. They provided free Internet service, so you can take your time browsing, checking emails, or post updates to social media sites. Around 6:20 AM, we were called to board the plane, but the plane departed at around 7:15 AM due to some problem with the fuel system. Anyway, it was a smooth flight. No major bumps on landing and while on the air. We arrived in Jogja around 9:30 AM and quickly moved to the immigration area because the place is very small and so crowded with lots of other people lining up waiting for their turns. Anyway, it's good to be home again. Today is my second day in Kuala Lumpur and today's schedule is going to Genting. We were picked up by the driver at 9 am and then goes straight to Genting, but in our way, we visited Hindunese temple called Batu Caves. We took some photos there and then continued our journey to Genting. It took us about one hour to reach Genting. The weather was so breeze and cool, so i like it so much. We were dropped off the lobby and we go straight to the indoor theme park to the casino area. Unfortunately, i couldn't go in because i'm not wearing shoes (silly stupid mistakes). So i travelled the area looking for interesting games while waiting for the rest. In just around 30 minutes, they goes out of the building and then we continued our adventure. First off, we took the one day unlimited ticket for indoor theme park for MYR 30 (adults). We played several attractions there, but i missed some of them which i planned to, but i didn't have time. If you want to see most of the genting area, i would suggest you to take the catepillar monorail. It took about 30 minutes to complete one round, but it's worthed. If you wanted to play all games there, spend one full day at Genting. I only spend around 4 hours there, so i missed a lot of interesting games. Next, we head back to KL and goes to Thean Hou temple. It was a fascinating temple and you can take a picture with 12 Chinnesse zodiacs. Next, we went to mid valley megamall and spend some time there and have dinner. We ate papa john's pizza. Then we went back to the hotel, but before that, i took a picture near the famous twin tower. It was not the best angle and position since it's very short time, but it's ok. That's a risk of travelling with big group of people. You don't get enough time for yourself. Mostly when you are the youngest one. Today, i'm heading to Kuala Lumpur after spending two days in Melaka. I wasn't able to enjoy Menara Tamping Sari,one of the most famous attractions in Melaka, based on Tripadvisor application that can be found on AppStore for free. It was too late last night and my wife was scared to go up with me. KDE 4.8.2 is going to be released by this week after Dirk has uploaded the sources on their FTP servers to be tested bu the packages. Some patches goes through and forces to packages rebuilt, but it's all for good reason, to make it better release than ever. KDE will make an official announcement in the next few days and hopefully most packagers are ready to build those packages to their linux distribution. Meanwhile, in his short email, Dirk has sent a resignation letter to his current position of being KDE release manager for 4.9 branch. He will keep maintaining 4.8 branch until 4.8.4 (the last planned release for KDE 4.8). We will see a new release manager for 4.9 in next July. What's In Linux Kernel 3.4? Linus has released Linux Kernel 3.4-rc1, which means that the merge window for big features to be included on the next major release of Linux Kernel is now closed. All future features that are not yet in the mainline tree will have to be postponed until the next Linux Kernel 3.5 development which should be in June/July (depends on how great the development of Linux Kernel 3.4). Next questions that arise will be "What will be included in Linux Kernel 3.4?" I will be away for one week starting tomorrow until this Sunday. This blog will not be updated unless i can find a good Internet services where i will be heading to. I will try to post a scheduled post in the next few hour if i find a good material to be posted on this blog. That means, i will not be able to reply most of your emails even if i find a good services. I will prioritize emails that's related with work first. Others will be replied if it's really important. Google is creating a special version of Google Maps on this April Fool and that is Google Maps in 8 Bits. Now you can see what most gaming console in the past look like when you played a RPG-based games, such as Final Fantasy, Zelda, etc. To try the new Google Map, just go to Google Map, find the area you want to be displayed, and click on the top right of the map area. You will see a green, yellow, and blue area which is a common color for 8 bits game. To see previous pranks and list of pranks for this year, have a visit on Wikipedia.